Various Greek Key names used to describe the Greek Key Pattern include Greek Fret, Greek Key, Labyrinth, Maze, and the Meander Pattern, (the latter named after the Maeander River, the historical name for the Büyük Menderes River in Turkey). Investors in Georgian Jewelry enjoy having authentic examples of the Greek Key, commemorative of the late Georgian period. Greek Key patterns were incorporated into Georgian jewels of the late Georgian period. The design, can also be seen in later historical periods, such as the Art Deco Period, right up to the present. 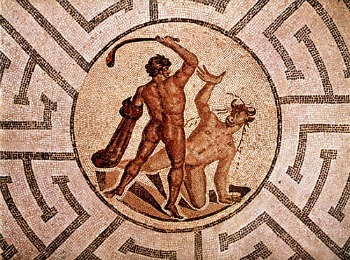 The pattern originated from Greek mythology and were symbolic of the labyrinth that imprisoned the Minotaur. In Greek mythology the Centaur had the torso of a person combined with the body of a horse. In a time when most people could not write or read, myths were the most effective way to pass knowledge and teach people about moral virtues, cosmology, love, death, forgiveness and everything that is present in our daily lives. The pattern is often incorporated as a border design around a ring, bracelet or cameo surround forming a running ornamental design of repeated symmetrical figures. Antique Jewelry with the Greek Key Motif is becoming increasingly harder to find, due to the fact, that Antique Jewelry collectors do not like parting with these amazing meandering patterns. Georgian jewelry featuring a Greek key pattern is highly desirable, and you will pay more for Antique Jewelry where the ancient Greek design appears. The pattern is also known as a running ornament or 'meander' when the design is continuous or intertwined as foliage meanders. The Meander motif, when used in architecture in Anatolia in Turkey, is referring to the river "Meander." The Spiral Meander motif has a long history in the Mediterranean. If the decoration forms interlaced patterns it is known as Guilloche and is also found in Classical Greek and Roman architecture including Georgian revival, Greek revival, Neoclassicism and Second Empire. In Europe, this pattern was included in the dominant style of architecture during the 18th century. The style of architecture also influenced and was reflected in the jewelry of the time. The Greek Key design isn't only found on jewelry. In the photograph below is a pavement in the streets of Rhodes, made from beach stones, featuring the "meander" Greek key pattern! This is the work of Hannes Grobe, who kindly permitted me to reproduce this image on Antique Jewelry Investor. Now, what would the earth look like from space if we were to re-surface all those ugly old black tar roads with Greek Key design cobblestones, like in the streets of Rhodes. Wouldn't that look something from space! Curved or angular variations of the same key patterns are also in existence. Being very ancient motifs they occur in the earliest farming communities in Anatolia in the six millennium BC and were a major feature design in pottery decoration throughout Neolithic Europe. Designs based on spiral scrolls, circles, and meandering bands are typical of the art of the Mycenaean civilization on the Greek mainland in the middle of the second millennium BC. During the Georgian neoclassical movement when Europe was having a revival in classical Greece, the Greek key pattern above all others signified Greek style and taste. The connection with water persisted into Roman times when the motif was frequently used on mosaic floors in bath houses. Men's jewelry may also include the key pattern. Jewelry art historians, will know, that throughout the History of Jewelry men have been adorning their bodies with jewelry for as long as women, but for slightly different motives. Women’s jewelry was generally worn to enhance a woman's beauty while in modern times most men have worn jewelry mainly as a status symbol, badge of rank, or for recognition of achievement. But times are changing and changing fast. This ship is slowly turning around. Gender Appropriate Jewelry? If it floats your boat - wear it! Popular motifs on men's contemporary jewelry include the Celtic knot patterns, Greek key designs, Arabic geometric patterns and abstract designs.